Following the recent election conducted during the 29th AFC Congress Kuala Lumpur 2019, the BFF’s president was elected as the AFC executive committee member on a four-year term. This important milestone in Bhutanese football history is expected to further develop the sport in the country. “For nine years, I have been passionate about football and developing football in Bhutan. But now I have got the platform to voice this passion in the AFC as an executive committee member,” Ugen Tsechup Dorji, the President of BFF, said. He added as an executive committee member, it will also provide him with an opportunity to help the smaller Asian nations to develop football in their respective regions. 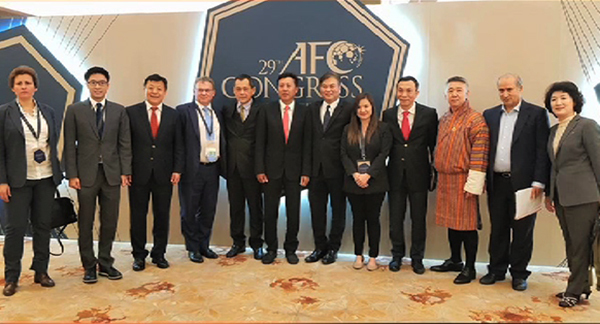 The AFC Executive Committee is responsible for implementing the AFC’s statutes, the decisions of the AFC Congress, as well as ratifying decisions made by AFC’s Standing Committees. Today, AFC comprises of a President and 24 elected members from the 47 Member Associations.